My grandparents will be the first to attest that I despised coconut anything growing up. Any cakes or baked goods with the flaky shreds of coconut I’d proclaim, “taste like soap.” Clueless where I came up with that one? Thank goodness our taste buds mature and develop with us into our adulthood. Fast forward to my adulthood and I couldn’t even image not liking the taste of coconut. Missing out on coconut cake, coconut frosting, piña-coladas, coconut water, coconut milk, the list goes on and on. How about you, do you like coconut or coconut flavor? This is the moment I wish we had some smell-o-vision from my screen to yours. We opened the jar and immediately were reminded of a tropical island. No, not the super potent car air freshener that gives you a headache when you first open it and can taste it in your mouth. More like the coconut smell that transports me when I can close my eyes and almost feel a light sea breeze blowing while lounging on a tropical beach (it could just be our fan too). Regardless it’s certainly hard to fully describe in words how divine the smell is! Folks just trust us on this one. 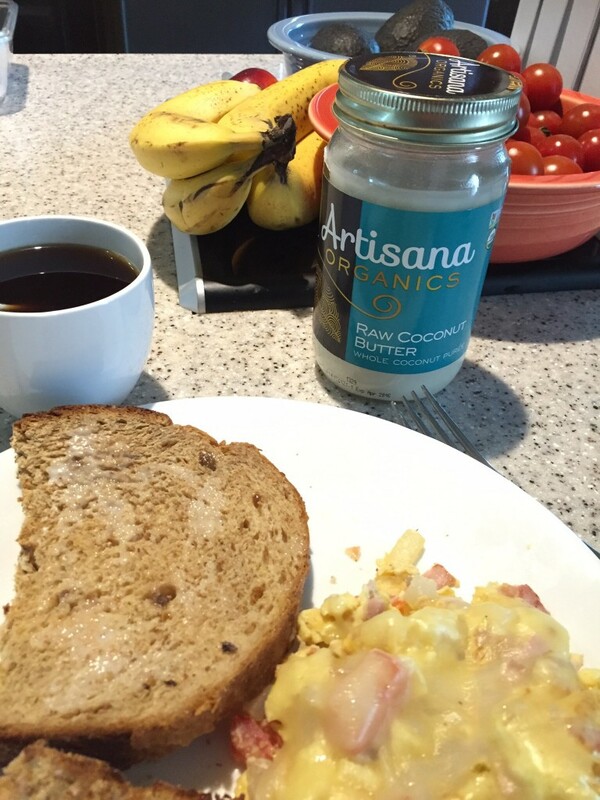 When we first got our jar of coconut butter it was in solid form, however with the recent change in temperature it is a liquified butter that just like natural peanut butter can separate and just needs a good stir to eat. So onto the taste…..drum roll please! We’d like to describe it to you as naturally sweet and packed full of incredible coconut flavor! We’re finding every excuse to slather or drizzle the stuff on our meals. Suchhhhh a delicious treat and it’s healthy too! Just like their product marketing states, no additives, only pure, unadulterated coconut! This little butter babe has certainly jazzed up our breakfast routine and I don’t see us giving up on it anytime soon. Stay tuned for more featured debuts in our cooking and recipes.